Thank you for your submission! We will contact you soon. Getting a diagnosis of prostate cancer can be overwhelming for patients and their families. For most patients, a cancer diagnosis comes with a long list of pressing questions: Am I going to live? What about my family? How will this change the way I live my life? What treatment is right for me? Diagnosis is just the first step on a prostate cancer path that can become a lifelong journey. Getting answers to pressing questions about prostate cancer can help patients and their families – as well as their doctors – manage the disease and move forward with confidence. Talking to other patients who are living with prostate cancer and hearing about their journeys can be informative for those who have questions about the disease or its treatment. View our list of prostate cancer support groups. Prostate cancer is a complex, highly variable disease. Although it is often nonaggressive, 10-15 percent of men with prostate cancer have aggressive, life-threatening tumors.2 When it comes to making personalized decisions about prostate cancer management, the most pressing question for patients and doctors may be how aggressive is a specific patient’s tumor? Traditional measures for assessing prostate cancer risk don’t provide all the information needed to appropriately determine treatment options. Clinical tests such as Gleason score and prostate-specific antigen (PSA) serve as standard measurements for prostate cancer severity, but do not measure how aggressive the prostate cancer is or predict outcomes such as cancer-specific death and recurrence. Real patients share their stories about how Prolaris has guided them along their prostate cancer path. Jerry Lanchbury, Ph.D., Myriad Genetics chief scientific officer, provides insight on the development of Prolaris. Prolaris is a prognostic test developed to assess the aggressiveness of prostate cancer by measuring the intensity of tumor cell proliferation in prostate tissue. Prolaris is now included in the National Comprehensive Cancer Network (NCCN) guidelines for all appropriate patients with localized prostate cancer.3 In August 2015, Medicare approved coverage of Prolaris for patients with low-risk and very low-risk prostate cancer (as defined by the NCCN). The Medicare decision extends coverage for testing to the approximately 60,000 patients with localized prostate cancer in the United States who meet the low-risk and very low-risk criteria. 1. American Cancer Society. Prostate cancer. Available at http://www.cancer/org/acs/groups/cid/documents/webcontent/003134-pdf.pdf. 2. Harvard School of Public Health. The prostate cancer predicament. Available at http://www.hsph.harvard.edu/news/magazine/the-prostate-cancer-predicament/. 3. Myriad Genetics. 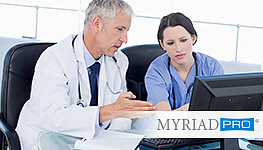 Myriad announces inclusion of Prolaris test in NCCN guidelines. Available at https://www.myriad.com/investors/press-release-detail/?newsItemId=878212. 4. Cuzick J, et al. Validation of a 46-gene cell cycle progression (CCP) RNA signature for predicting prostate cancer death in a conservatively managed watchful waiting needle biopsy cohort. American Urological Association Annual Meeting, May 20, 2014, Orlando, FL. 5. Bishoff JT, et al. Prognostic utility of the cell cycle progression score generated from biopsy in men treated with prostatectomy. The Journal of Urology 2014; 10.1016/j.juro.2014.02.003. 6. Shore N, et al. Clinical Utility of CCP Test in Personalizing Prostate Cancer Treatment. Presented at American Urological Association Meeting, May 17, 2015. Available at https://myriad-web.s3.amazonaws.com/myriad.com/media-kits/Clinical%20Utility%20of%20CCP%20Test%20in%20Personalizing%20Prostate%20Cancer%20Treatment.pdf. 7. Crawford ED, et al. Evaluation of the economic impact of the CCP assay in localized prostate cancer. 2014 Society of Urologic Oncology, December 3, 2014, Rockville, MD.